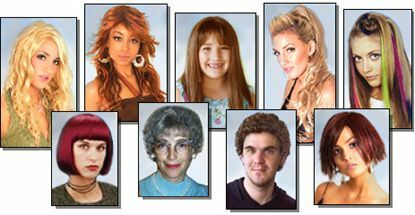 Wigs, hairpieces, extensions -- for women, men, children. Fashionable styles for all ages. SeneGence Cosmetics-- Long Lasting Waterproof Make-up. Smear Proof Lipstick. Anti-Aging Skin Care. Cosmetic Application -- How to use SeneGence Cosmetics. Makeovers -- Before and after photos using SeneGence Cosmetics...and new hair in some cases! FUN! Hot Pink Car -- Check out this cool car. Princess Photos -- Costume Party. Punk Photos -- Costume Party.